If you're looking for the strongest Kava experience on the market, forget the 55% Kavalactone Paste you can find elsewhere on ShamansGarden. 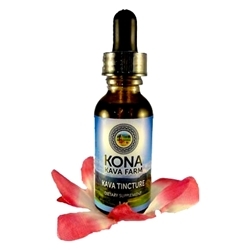 The new Kona Kava Farm Kava Tincture MAXIMUM 12% is Kava is the product you need to try. This Kava Liquid Extract is expertly blended from a formulator who's been crafting the strongest Kava products for over 20 years. We've tried most products on the market, and although the Kavalactone Paste was the clear winner for strongest Kava experience up until now, the Kava Tincture MAXIMUM 12% easily takes first place. Effects are felt within seconds of placing your first dropper under your tongue. A single serving will get you an entire day's Kavalactone in just a couple dropperfuls. If you're looking for the strongest Kava experience on the market, forget the 55% Kavalactone Paste you can find elsewhere on ShamansGarden. The new Kona Kava Farm Kava Tincture MAXIMUM 12% is Kava is the product you need to try. This Kava Liquid Extract is expertly blended from a formulator who's been crafting the strongest Kava products for over 20 years. This is a water-only extraction that is then suspended in the perfect blend of glycerin and grain alcohol. This organic full spectrum extracts are crafted from the highest quality farmed or sustainably harvested exotic botanicals in pure grain alcohol . Full spectrum extracts. Hand-crafted in small batches. Infused with pure passion. Directions: 40 drops (2 dropperfuls)once daily. Daily dosage not to exceed 2 mL. Ingredients: Liquid extract of Kava root, grain alcohol, glycerin, vanilla.